Dorothy Hernandez and her daughter Leejona are participating in the Community Clearinghouse's Adopt-A-Family program. Leejona was born with cerebral palsy, and the only thing Dorothy wants for Christmas is a folding aluminum chair so she can take her daughter down to the beach and hold her while her feet splashes in the waves. Dorothy Hernandez is looking for an aluminum beach chair so that her daughter, who has cerebral palsy, can once again feel the waves curling around her ankles or the sand between her toes. Leejona Hernandez hasn't been to the beach for several years. "She loves that; she gets so excited," said Dorothy, who takes care of Leejona at their Waianae home. Over the years Leejona, now 24 and about 90 pounds, got too big for her mom to hold safely on her lap at the shore. Dorothy thinks she could once again hold Leejona in her lap if they had an aluminum beach chair that she could place at the water's edge, she said. Dorothy's main job as the primary caregiver to her disabled child doesn't pay her a salary, but "we manage somehow" on welfare, federal assistance and subsidized rent payments. This is where the Community Clearinghouse Adopt-A-Family program and the Star-Bulletin's annual Good Neighbor Fund can help. The clearinghouse, run by the nonprofit Helping Hands Hawaii, is asking the public to donate requested items and monetary contributions to brighten the holidays of families in need. Dorothy said her daughter is "a great girl" in spite of all her physical and mental challenges. Leejona can't walk, dress or feed herself and needs someone to change her diaper and give her a bath. She can say several words, like "hug," "more," "water" and "I love you" in her own way -- "It's not clear, but we know what she means," Dorothy added. Leejona's life is limited to attendance at a state-subsidized adult day care center on weekdays via the Handi-Van. It takes hours to go to Leejona's medical appointments on the bus because they don't have a car. Having a portable CD player would help pass the time and satisfy Leejona's love for music, Dorothy said. Her brother Jazz, who lives with them, is the only other person to help with the care, although their sister comes home to help when she can. Dorothy said, "I try not to get sick, but even when you get sick, you still have to do things." Just getting Leejona ready to go anywhere is exhausting. "I get all sweaty and all worn out," Dorothy said, adding she has to force herself afterward to get ready and do something just for herself. Her biggest worry is one shared by all parents with disabled children -- what will happen to Leejona after Dorothy dies or is unable to care for her. Dorothy said her other daughter, 21, "will be here for her. She loves her sister very much and will not abandon her." Dorothy said she has never even thought about putting Leejona in a foster home to make things easier for herself. "I was raised in a foster home till I was 18, and even though I was lucky to have a good one, I did not want my daughter raised in a foster home. I can give her love that nobody else can. If it happened now (going to live elsewhere), she wouldn't last long. "She sleeps with me since she was a baby; she always sleeps with me," Dorothy said. The Star-Bulletin's Good Neighbor Fund will take donations until Dec. 31, and will list donor names in the paper until Jan. 11. Monetary gifts may be sent to: Honolulu Star-Bulletin's Good Neighbor Fund, c/o Helping Hands Hawaii, P.O. Box 17780, Honolulu, Hawaii 96817-0780. In addition, checks (not cash or gifts) made out to the Good Neighbor Fund can be dropped off at any First Hawaiian Bank branch from Tuesday through Dec. 31. 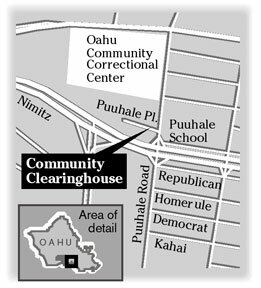 Clothing, household items and gifts can be donated at the Community Clearinghouse, 2100 Nimitz Highway. Call 440-3804 for information about the program or to arrange for pickup of large items. You may also participate in the Adopt-A-Family program, in which businesses, employee groups, social clubs, families or individuals can help a specific family. For information, call 536-7234, ext. 804. Five dollars will be donated to the Star-Bulletin's Good Neighbor Fund for every sale of Jefferson Finney and Pegge Hopper's just-released book, "The Clever Dog." The book is available for $15 at the reception desk on the fifth-floor office of the Star-Bulletin from 10 a.m. to 4 p.m.
Finney, the Star-Bulletin's circulation marketing (Newspapers In Education) manager, wrote the story about the skills and fantasies of an extraordinary dog. This is the first children's book illustrated by the renowned artist Hopper. "The Clever Dog" is published by Mutual Publishing.